About 7.5 million people received federally administered payments in December 2008. The average monthly payment in December 2008 was $478. Total payments for the year were more than $43 billion, including more than $4 billion in federally administered state supplementation. Fifteen percent were under age 18, 58 percent were aged 18 to 64, and 27 percent were aged 65 or older. Most (84 percent) were eligible on the basis of a disability. 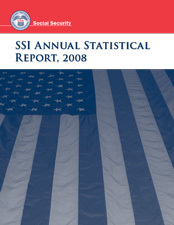 Despite their disabilities, about 356,000 recipients (5.5 percent) were working in December 2008.
suspension and termination of benefits. Clark D. Pickett managed the preparation of this report. Alfreda Brooks, Stella Coleman, Nancy Early, Art Kahn, Judi Papas, and Clark Pickett prepared the statistical tables and narratives. Staff of the Division of Information Resources edited the report and prepared the print and electronic versions for publication. Table 3, "Total recipients by age and source of payment," is new and covers all recipients who received at least one payment during the calendar year. Tables previously numbered 3 and higher have been renumbered. Table 77, "Recipients terminated, by age and reason for termination," was omitted from the 2007 edition and is now reinstated. Because the methodology for producing termination data has been revised, the data series begins with 2006; when last published, this table showed data for 1998–2005. Table 12 now includes number and average income of all recipients. Tables 14 and 32 now include data for Oceania, and detail for the top five countries of origin in most world regions. Tables 22, 30, 35, 43, 46, 51, 54, 59, and 65 now include detail for recipients aged 18–21, 22–25, and 26–29. Table 30 now includes number and percentage distribution of all recipients. Tables 45, 54, 61, and 67 now include percentages. Tables 46, 51, 54, and 56 now include detail for additional earnings ranges.